Some had never been to a beach and only weeks ago arrived from refugee camps in Thailand, but coaching and guidance from members of the Christian Surfers South East allowed them to enjoy the thrill of riding waves. Made possible with thanks to a Foundation for Rural and Regional Renewal ABC Heywire Youth Innovation grant, the surfing session was a chance for the new arrivals to experience the Australian way of life. Mount Gambier Migrant Resource Centre manager Anelia Blackie said it was great to see the youths step out of their comfort zone and try something new. 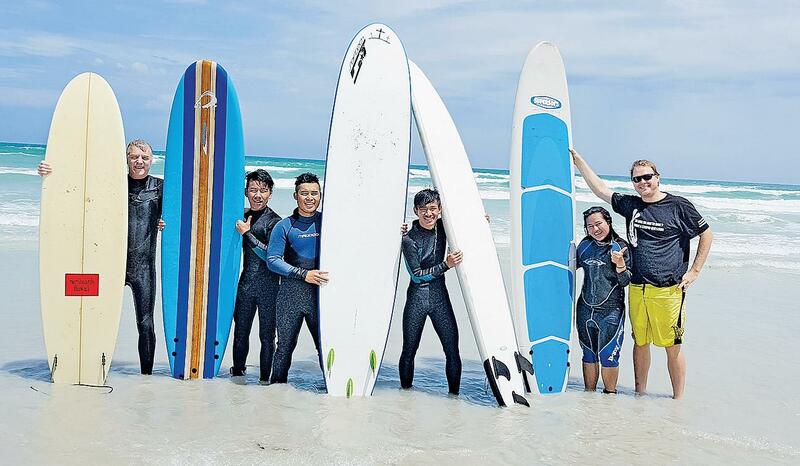 “Apart from having fun in the water and learning to master the skill of surfing, the aim was to also connect our migrant youth with a local Australian group,” she said. Helping the group to master the art of surfing, instructor Mick O’Donohoe said they were one of the best groups he has taught so far. “They were all really polite and keen to learn and even though some had never been to a beach before they were excited to give it a shot,” he said. Following the surfing lesson, the group of 25 also enjoyed a barbecue on the beach. Pictured are Richard Hein, Gay Lay Htoo, Ner Soe, Soe Ler Moo, Hsa Yu and Roy Fromberg.